The CYGNSS constellation has been operating in its science data-taking mode continuously since March 2017. The satellite hardware has been performing as designed while we make adjustments to the software on-board and on the ground so we are better able to operate smoothly and autonomously. We also spent much of the summer working on the relative spacing between the satellites, by adjusting their differential drag and, as a result, their relative orbital velocities. An example of a typical “day in the life” for CYGNSS is shown in this video, which combines together the wind observations made by all eight spacecraft over a 24 hour period on 20 June 2017. CYNSS wind observations (Level 3 v 1.1) made by the full constellation over a 24 hour period on 20 June 2017. Several things are noteworthy in the video. Active storm areas appear as the regions with yellow and (especially) red wind speeds. The global coverage is seen to extend between about 38 deg north and 38 deg south latitude. If you focus on any one location within that coverage zone and note when CYGNSS measurements are made there, you can get a feel for the temporal sampling properties. In the Gulf of Mexico, for example, winds are measured during the two time interval 1300-1600 and 2000-2300 UTC. This property, that measurements are made each day during two periods of several hours each, is common to all locations within the coverage zone. More recently, since the Atlantic hurricane season became especially active with major storms Harvey, Irma, Jose and Maria, we have focused on conducting targeted observations. This consists of predicting when we will pass over an active storm in the next several days, assembling command sequences to activate higher quality data-taking modes while over the storms, uploading those commands to the appropriate spacecraft, then scheduling additional contacts afterwards with our ground stations to downlink the higher volume of data for processing and analysis. In addition, we have been working closely with our colleagues at NOAA who operate the fleet of hurricane hunter aircraft, to coordinate their flights with our overpasses. On a number of occasions, they have been able to time the aircraft penetrations through the storm center so they coincided with CYGNSS overpasses, and to align their flight path so it paralleled the measurement track of the satellite. We are just beginning to evaluate these intercomparison data sets and intend for them to anchor our validation of high wind speed performance. Our measurements of the major Atlantic hurricanes this season are still preliminary. The algorithms used to convert radar engineering measurements into ocean surface wind speeds have yet to be fully validated at high winds and, when they are, we will likely tweak the algorithms in order to optimize their performance. 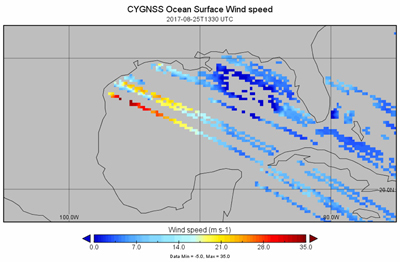 An example of CYGNSS measurements of the winds in Hurricane Harvey are shown here, taken on the morning of 25 Aug 2017. Harvey made landfall in southeast Texas that evening. 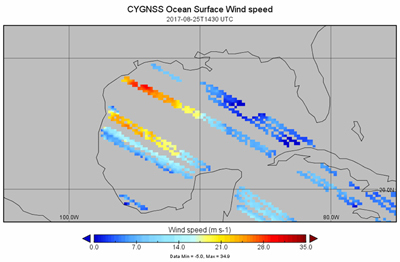 CYGNSS Level 3 gridded surface wind speed data product (v1.1). (top) at 1300-1400 and (bottom) at 1400-1500 UTC on 25 Aug 2017, prior to landfall at ~03:00 UTC on 26 Aug 2017. Hurricane Harvey is centered slightly off-shore, in the region of highest wind speeds shown in red. CYGNSS makes measurements continuously over both ocean and land. The ocean data are used to estimate surface wind speed. The land data are sensitive to the moisture content of the soil and, in the most extreme circumstances, can be used to detect and image flood waters. This is illustrated in the following series of images of CYGNSS measurements over southeast Texas made shortly before, and then in the days after, Harvey made landfall. 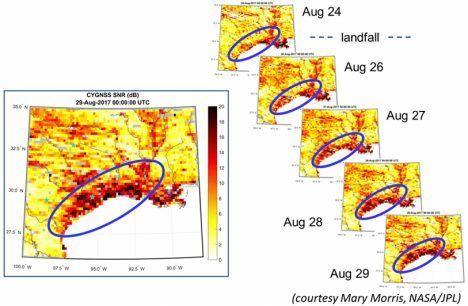 CYGNSS SNR images of southeast Texas before and after Hurricane Harvey landfall. (left) Aug 29 SNR image with coastal flooding circled. (right) Time lapse SNR images, with flooding inundation indicated by large increases in SNR. This entry was posted on Wednesday, September 27th, 2017 at 10:23 pm and is filed under Cyclone Global Navigation Satellite System (CYGNSS). You can follow any responses to this entry through the RSS 2.0 feed. Both comments and pings are currently closed.